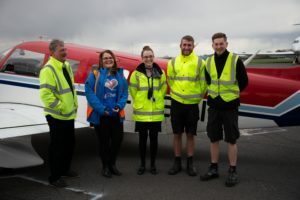 Charity fly2help ran their first Air Smiles Day of the year on Monday, 18th March 2019. The day was held at London Biggin Hill Airport and funded by the fundraising received from BACA last year. The beneficiary was a small family of three – Annabelle (10 years old) was diagnosed with a Chronic Rare Bone Disease at the age of 4. The disease causes her severe pain, to the point she just feels like giving up. Annabelle has endured years of MRI scans and several hospital trips for IV medication, lasting for three days each time. She can be up and about one day and in her wheelchair the next. Annabelle loves aeroplanes and the family spend lots of time at the Lookout Café, Biggin Hill, where she adores watching the Spitfires. She provides support for children living in similar circumstances through her @pack_steam (see Twitter) initiative; creating fun, educational packs for the children’s hospitals who’ve helped her. Everything the family has tried to arrange has fallen through due to illness, so Annabelle’s parents would love to give her something extra special – for being brave and bouncing back each time she is knocked by her illness. Annabelle has never flown before and dreams of taking to the skies. The Air Smiles Day was supported by many of the charity’s main supporters at Biggin. Signature Flight Support hosted the family at their FBO, providing the real VIP experience. The family were given a tour of the Biggin Hill Heritage Hangar; Annabelle loves Spitfires as her Grandad, Tom, flew missions on Lancasters as a Radio Operator whilst serving as an RAF Airman during World War 2. She was lucky to have known her Grandad until she was 4 years old, when the family sadly lost him – hence her close connection to historic aircraft. The team at the Heritage Hangar were so kind and let Annabelle sit in a Spitfire; this was the first aircraft she’d ever been in, so it was a really special experience! The family then enjoyed lunch before taking to the skies in a Cherokee 6 – Annabelle’s first flight experience. The day finished with time with the Airport Fire Service – spraying water around, exploring the fire truck and trying on kit. Annabelle was in her element and it was amazing to see how her confidence grew throughout the day. Annabelle’s Mother said ‘it’s so lovely to see Annabelle smiling and not allowing her illness to debilitate her. Two days ago, she was in bed and could barely move, so it’s an absolute joy to see her enjoying herself and receiving a special day. The whole family are incredibly touched by the effort that’s gone into providing this experience for us’. Once again, thank you to all of our members for your generosity and support, it really is appreciated and enables fly2help to make a difference.